AMISTAD TURNS 30. Altruistic group helps in disasterFundación Amistad Británico Mexicana I.A.P. He noted that Hurricane Manuel struck Mexico at the end of 2013 and caused severe flooding throughout the southwest of the country. In the coastal state of Guerrero alone, he said, over 30,000 homes were damaged, 20,000 people had to be evacuated to shelters and the total cost to repair damages exceeded $230 million. Following the disaster, Stabler said Amistad contacted Altius, a community clinic on the outskirts of Acapulco, through the organization Unidos por Ellos and the Anáhuac University. Altius had been severely damaged in the flood, and the foundation’s board of directors decided to spend just over half of their one-million-peso 2014 budget to restore the clinic. Stabler said that damaged medical equipment was repaired and the clinic’s electrical system was completely overhauled. “Now, thanks to Amistad’s assistance, the clinic is once again able to provide the community with vital healthcare services, from regular checkups to ultrasound and screening for breast and bone cancer,” he said. Stabler said that the other half of Amistad’s 2014 budget was earmarked for two education projects, the renovation of a Guerrero community school that had been rendered inhabitable by the storm and the completion of the final repairs to a school in Coatzacoalcos, Veracruz, that had been destroyed by Hurricane Alex in 2010. The Amistad Británico-Mexicana foundation was founded by a group of British businessmen two days after the massive magnitude 8.0 earthquake that demolished much of downtown Mexico City in 1985 and led to the deaths of at least 5,000 people. The founding group was led by Leonard Mayer and Robert Hickman, both of whom would later become presidents of Amistad, with the support of the then-British ambassador to Mexico with the objective of of-fering a joint humanitarian response to the tragedy. “From that moment on, Amistad has been a charitable institution dedicated to proving assistance after natural disasters in the fields of health, education and community welfare,” Stabler said. Also at that time, Amistad, working with the ABC Medical Center complex, helped build the Amistad Británico-Mexicana (Brimex) community outreach clinic at the hospital complex’s Observatorio campus. Later, when the ABC Santa Fe campus was opened in 2005, another ABC outreach clinic, Clinica Amistad, was launched. Both clinics serve low-income patients who do not have government or private-sector insurance and live within a five-kilometer radius of the respective hospitals. During the embassy residence reception, Stabler pointed out that Amistad only helps in times of natural disaster and sponsors ongoing programs of modest support to promote education, health and self-sustaining development projects in institutions throughout the country. The assistance offered by the organization is intended to be of lasting benefit, as opposed to rapid response aid, he said. “We do not attempt to provide water, clothing or foodstuffs, for example,” Stabler said. To date, Amistad has provided assistance to institutions in the states of Tabasco, Campeche, Chiapas, Hidal-go, the State de México, Morelos and Guerrero, as well as in Mexico City. Amistad depends entirely on donations for its financing. Roughly 60 percent of Amistad’s resources are donated by corporate sponsors and the rest comes from pri-vate sponsors. During the annual meeting, Amistad treasurer Armando Nuricumbo said 2014 had been a good year for the foundation in terms of donations, ending with assets of more than 1.7 million pesos. Nuricumbo said that 1.2 million pesos of that money would be held in an emergency reserve fund to be used in the event of a natural disaster. Notwithstanding, Nuricumbo said that Amistad had not reached its target goal in overall donations and had consequently needed to make significant administrative changes in order to cut operating costs. Now that the internal structure is efficient, he said, there must be a greater focus on fund-raising. “There is no lack of projects, but there is a lack of funds for them,” Stabler said. 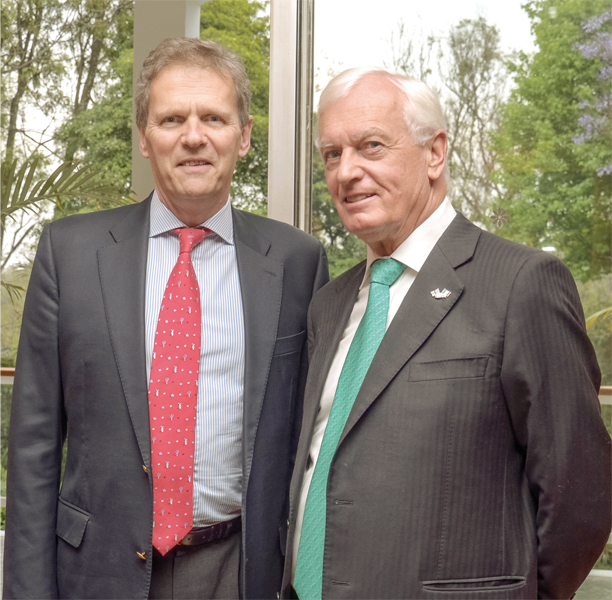 Despite these difficulties, Ambassador Taylor, who as head of the British diplomatic mission in Mexico is Amistad’s honorary president, said that since 2015 had been officially declared the Dual Year of Mexico and the United Kingdom, there are new opportunities for investment and trade. Taylor said the two countries enjoy a “very impressive relationship” and have agreed to work closely on many fundamental issues, including climate change, health policy, education, free trade, open government and energy policy. Esta entrada fue publicada en Fundación Amistad Británico-Mexicana I.A.P. y etiquetada Amistad Británico-Mexicana I.A.P., Colin Stabler, Duncan Taylor, Fundación, México por Fundación Amistad Británico-Mexicana I.A.P.. Guarda enlace permanente.